Our Rottweiler youths are from 100% German & European bloodlines, and come from exceptional German Rottweiler Breeders or exceptional European breeders. Our youths have proven to grow into Rottweiler adults with large block heads, robust chests, excellent conformation, and sound temperaments. Our Rottweiler males must be stable, with very high confidence, good conformation, and high prey and ball drive. Each Rottweiler male puppy in our kennel was selectively picked from thier litter for these traits. Our next Rottweiler puppy youth that arrived at our kennel is Betty, she has a wide robust chest, large masculine head, strong bone substance, and excellent temperment. The German Rottweiler puppies we buy have excellent pedigrees for another Rottweiler breeder to use in his breeding program. 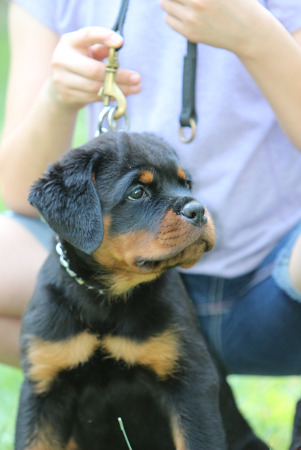 Our Rottweiler pups are excellent kennel build dogs for show, conformation, schutzhund, and pet.